Today is Fashion Revolution Day. A day on which Fashion Revolution is hoping to use the ‘power of fashion to inspire change and reconnect the broken links in the supply chain’. Two years ago to the day the Rana Plaza, a garment factory in Bangladesh which supplied western brands, collapsed. 1,134 lives were lost and many more were broken by life-changing, debilitating injuries. The word ‘tragedy’ doesn’t feel harsh enough, 1,134 is a number too large to comprehend and the knowledge that this disaster wasn’t an isolated incident in the garment industry is frightening. Fashion Revolution recognised that something needed to change and subsequently are working to create a ‘fashion industry that values people, the environment, creativity and profit in equal measure’ – sounds like a bloomin’ good idea to me. 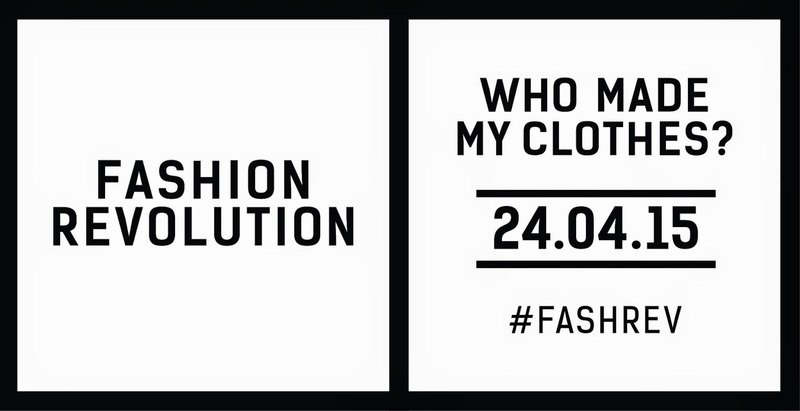 They are asking for more transparency in the industry so to highlight this they are asking us to raise the question ‘Who Made my Clothes?’ Put on an item on clothing inside out, tweet a picture of the label asking the relevant brand the question and use the hashtag FashRev to get involved. Last week I spoke about the article in the Telegraph encouraging us to document our Haulternatives as another way to get involved with Fashion Revolution Day. A haulternative is an alternative haul which highlights ethical fashion. They suggested picking an area of ethical expertise. As I’ve mentioned in previous posts, I don’t claim to be an expert in many things but I do know a little about charity shopping. Since I haven’t been on a spending spree for a good ol’ while I thought I would share my favourite charity shop purchases over the past year. So here it is – my haulternative. A collection of second-hand finds over the past 12 months. This 70’s style shirt was a bargain at around the £3. With all things flares/floppy hats/burgundy/70’s set to be massive this Spring/Summer, this shirt was too good to pass up on. As part as a ‘5 Minute DIY‘ post I cut this shirt and left the edges to fray. Best decision I ever made. Since hacking a good few inches off the bottom I have worn with everything from jeans (braving the double denim) to maxi skirts. One of my most worn skirts is the above checked number from Oxfam. Perfect for any occasion with Dr Martens/Band Tee/Scruffy hair for a lazy Sunday (or a ‘I can’t be assed Monday’) and shirt/boots for the more appropriate Monday outfit. When I spotted crocodiles and palm trees in unison on a skirt, I had to have it. Since I couldn’t wait until summer to wear summer appropriate clothes I teamed it with the shirt/leather jacket combo to be more suitably prepared for the depths of the English winter. 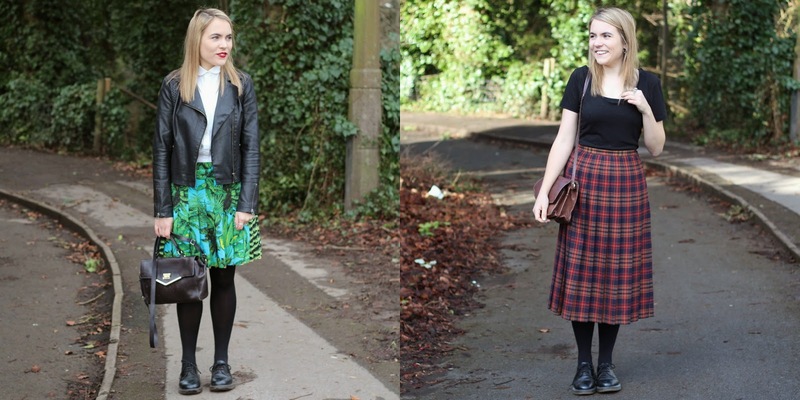 The grungy tartan midi skirt sits at the forefront of my wardrobe because it can be worn as easily with a slouchy t-shirt as it can be with an ironed shirt and lace-up shoes. This skirt is the perfect one for clashing prints. I don’t think the print matches much in the way of bags so I like to just go all out there. This is also one of those summer appropriate skirts I have been wearing through winter as I feel the print is too pretty to stay in my wardrobe for 6 months of the year. The green leafy print dress above has been a go-to over the past few months. The feminine style balances the grungy print perfectly – and it goes with my Dr Marten’s which makes life a little easier since I wear these pretty much every day! The velvet oversized top is the perfect substitute for an evening dress. For an alternative (and incredible comfy) party outfit, I wore this top as a dress with my favourite blue boots. Slightly dressy for me but I love the snazziness (sorry) of the above outfit – I think my Mum was fairly surprised when I floated downstairs with brushed hair and a girly dress. It made a welcome change from my usual unbrushed hair, Dr Martens and tartan skirt assemble. Denim seem to be all over the high-sreet since the Alexa Chung for AG Jeans collection so when I spotted this button-up dress in Oxfam I put in my basket faster than you could say ‘MINE’. The dress was originally down to my ankles but with little hesitation I grabbed my scissors (after I had bought it!) and cut the length to better suit short ol’ me. I didn’t wear much else last summer. This dress is so comfy and lightweight. I especially love the colour and felt that it fit as perfectly with boots and socks for Landan Town as it did with sandals for those sunny holidays. My first post of this year consisted of this DIY’d dress from Oxfam. Originally an 80’s dress with those big ol’ classic sleeves, I cut the length (and the sleeves) off and dyed it to a colour better suited to me. When I first came across this dress in Oxfam I loved elements of it but not all of it. It was a fun challenge keeping the areas of the dress I loved (the low back and the bow) but adjusting the rest of the dress to my taste. Since DIY-ing it remains one of my favourite dresses. Thank you so much for reading my haulternative and please leave links below if you are getting involved with Fashion Revolution Day as I would love to see what you get up to.